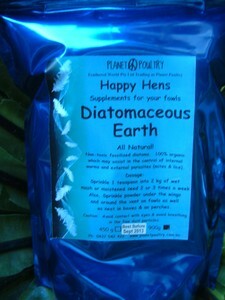 Diatomaceous Earth - All Natural! Non-toxic fossilized diatoms. 100% organic. May assist in the control of external parasites (mites & lice). For internal parasites we suggest the use of Molidri. Poultry Dosage for external parasites: Sprinkle powder under the wings and around the vent on fowls monthly. Sprinkle in next boxes and on perches every month or more often as necessary. Caution: Avoid contact with eyes & avoid breathing in the fine dust particles (use of dust mask recommended). 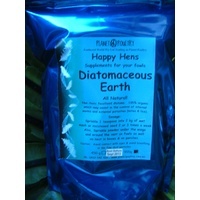 Natural Pest control Mites and Lice, Poultry, fowls, bantams, chooks, chickens, chick, hens.